From the team that brought you "Daredevil" comes the next installment in the "Defenders" series, the ingenious "Jessica Jones". I've had the honorary pleasure of getting a taste of the pilot and have to say, "Marvel" is a force to be reckoned with at this point. "Jessica Jones" on a movie platform would be very weak however since Netflix stepped in and helped "Marvel" get individual series for these characters, instead makes the weakest characters the strongest. I knew nothing about "Jessica Jones" before going into the serious other than the fact that she was in the "Marvel" universe, so for me this was going to be a treat either way. 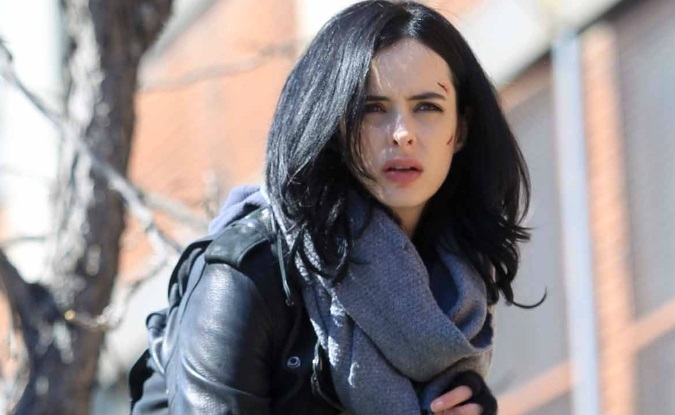 Netflix and Marvel team up to take us inside the world of "Jessica Jones" which follows a private investigator named Jessica Jones played by Krysten Ritter. Struggling through life, Jessica takes on a case to find a missing woman while in the process battling her intense panic attacks and visions of a man who seems to be following her. The "Pilot" episode doesn't give away too much which is fantastic, keeping us hooked and wanting more is always the key to success in these TV Series. The first episode of the series also introduces some more key characters such as "Luke Cage" played by Mike Colter and Kilgrave played by David Tennant. Taking in all aspects of "Jessica Jones", I feel as though "Marvel" has finally reached its mature peak. In the past we have seen some semi serious tones in "Marvel" films or even their latest Netflix series "Daredevil", but that’s nothing to the tone that "Jessica Jones" takes. A gritty "Neo Noir" feel is what you get in the pilot and it really seems to carry on beyond that since I was also able to view episode 2. I do see a few minor weaknesses in the show so far such as a few onscreen "Goofs" or some pacing issues but it seems as though each episode gives the opportunity to breathe new life into the series and those issues quickly fade as you progress through to episode 2. I was highly Impressed with the directing style present in the pilot, the vibrant lighting in some of the darker shots to induce silhouette shots for noir feel were gorgeous. If the lighting wasn't enough, the camera shots were spot on for a television show. Above all else it’s the writing that really brings out the magic in "Jessica Jones" which we have Melissa Rosenberg the creator to thank for that. The dialogue in Jessica 's narration of her own life alone is intriguing to us seeing as how she doesn't see herself as a good person. The narrative only brings more depth to her character and when she's in the presence of anyone she might have a connection with everything flows naturally. Ritter is surely moving up as an actress and I can tell by her performance in "Jessica Jones" alone that we can expect some very good things if she's to be a lead in a dramatic role. Mike Colter also gives a very slow burn suave style to the "Luke Cage" character. Whenever Colter is onscreen you really sense that the show runners pay respects to the "Black Exploitation" vibe that Luke Cage always had, stemming from the music to the behavior around his female companions. 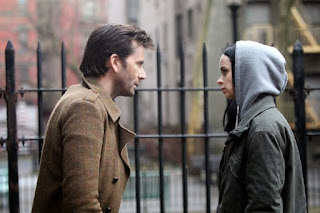 I was also wowed by David Tennant's performance as "Kilgrave", to have such a collected descent into madness vibe, as the antagonist is something I adore. When Tennant is onscreen you can't help but root for him no matter what the scenario. Kilgrave is shown to be very collected but very sadistic at the same time; even though the abilities aren't what we want them to be he uses his main power of persuasion very well. 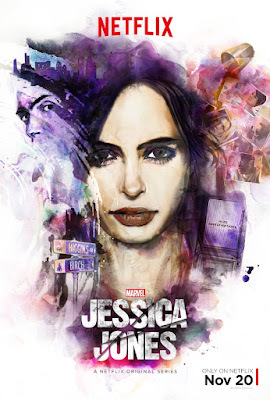 All in all "Jessica Jones" is by far my favorite "Marvel" character yet, proving to be one of the more down to earth more relatable characters. I see myself binge watching this show come November 20th and I highly recommend you do the same. From the performances to the writing to the directing, "Jessica Jones" has everything needed to hold up in the "Marvel Defenders" universe and in my opinion beats "Daredevil" out by a landslide.